Keep your iPhone 4 safe with Doctor Who! 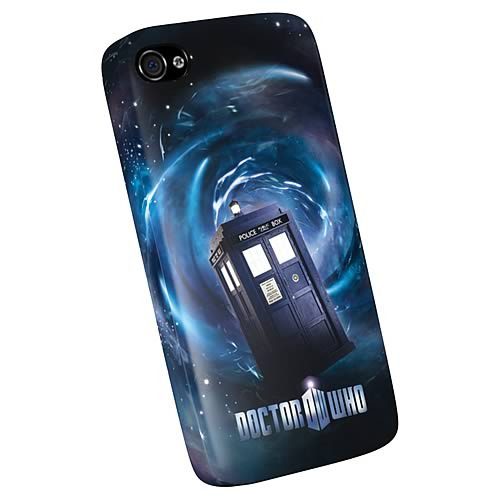 This TARDIS iPhone Cover is specially designed for the iPhone 4. You'll have access to all touch controls and the dock connector. Security with style! Take your iPhone 4 on a journey through time and space with this fantastic addition to the incredible and expansive Doctor Who universe! The stylish Doctor Who TARDIS iPhone Cover in hard plastic is designed especially for the iPhone 4. Cover measures approximately 4 1/2-inches tall x 2 1/2-inches wide x 1/2-inch thick. Durable and secure, it slips simply on for easy use. Form fitting for an effective grip and protection without bulk, you'll have access to all touch controls and the dock connector. This Doctor Who iPhone Cover features the wondrous TARDIS time machine/spacecraft. Grab one today! Ages 13 and up.